I always feel a bit of guilt when eating at an establishment with a fair amount of hype, and I suspect I’m not alone in that. Shouldn’t I been down some dingy alley, finding the place no one else has heard of? Wouldn’t their sandwich be better than this one? That’s probably nonsense, but the human heart is not quite so straightforward as a fine sandwich. City Sandwich is just the kind of establishment with a grand reputation, and what’s more the Nuno is a particularly praised sandwich. So I was compounding my own sin, if it can be called that, but I’m not going to apologize for even a second, because this is an amazing sandwich. 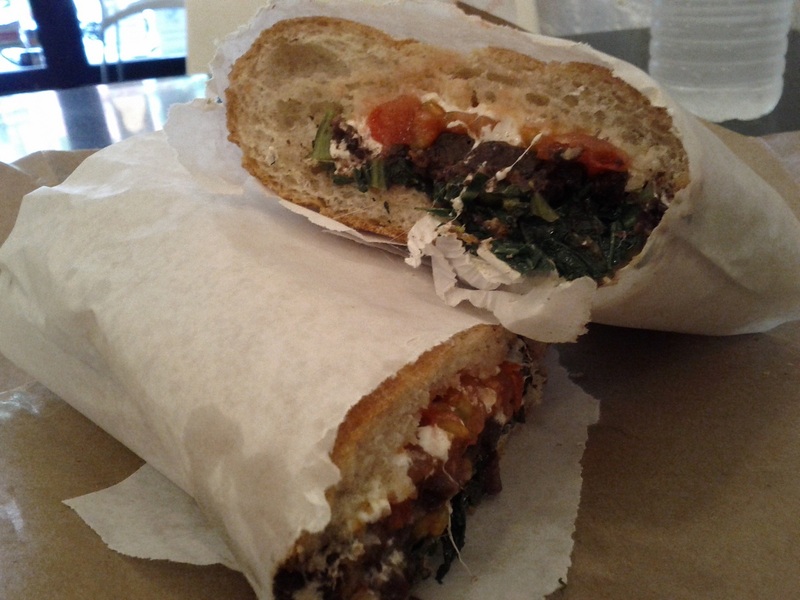 The Nuno is Portuguese morcela (blood sausage), broccoli rabe, tomato, collard greens and mozzarella with garlic and olive oil. It’s a timeless archetype—meat, greens, tomato, cheese—and it’s timeless for a good reason. The blood sausage and the broccoli rabe is the winning move here, with the sausage bringing a rich, complex flavor and the greens a bright, earthy undertone. The cheese is melted and stringy, mozzarella a fine choice to not overpower the rest of the sandwich, and the bread is crispy with a tender, yielding crumb. While finding an unheralded gem of an establishment or a sandwich is undoubtedly a thrill, you owe it to yourself to just can it and get in line with everyone else. City Sandwich is one of those times; make your way past the growing mass of newspaper clippings and printed blog posts at the door and have a sandwich. You won’t regret it. This entry was posted in Sandwich Reviews and tagged New York, Reviews by Pete, Sandwiches I Have Eaten, Sandwiches Made For Me, Sausage by Pete. Bookmark the permalink.